Aston Martin has been ultra active so far this year. Some time ago they promised to produce at least one new model every 12 months for the next seven years, so being busy certainly makes sense. This said, no one expected they’d bring three cars to market this year alone. No wonder Aston Martin has become the world’s fastest growing carmaker as per percentage sales growth, which is a big change from a few years ago when it seemed more like of an alternative to more developed names like Porsche, Ferrari, and even Maserati. We all know there’s an Aston Martin supercar on the way at some point in the future, but until that mid-engine exotic arrives the Gaydon, England manufacturer has something considerably more practical yet every bit as enticing on the offing. Meet the 2019 DBS Superleggera, 007’s next ride and potentially your next love. It’s a credible foe to Ferrari’s 812 Superfast and a worthy replacement for James’ previous Vanquish, while it’s also one of the lightest and certainly meanest Astons to ever hit the street. 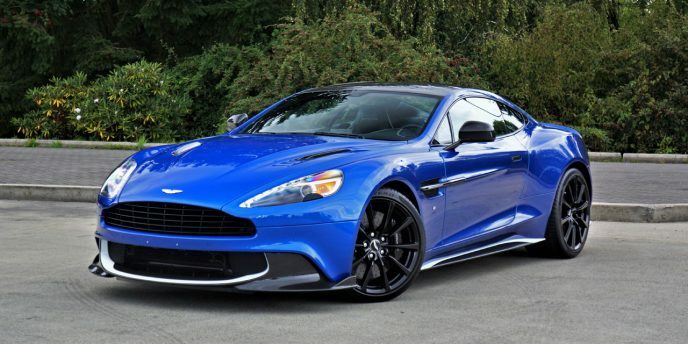 The name DBS should be well known to Aston Martin fans, as the Marek Reichman and Henrik Fisker designed model was the brand’s flagship model from 2007 through 2012, its predecessor the 2001 through 2007 first-generation Vanquish S. The DBS nameplate first appeared on in 1967, while the name Superleggera pays homage to the historic super lightweight construction technology of revered Italian coachbuilder Touring. Like the Vanquish, which was based on the previous DBS that was originally sourced from DB9 roots, the new DBS Superleggera rides on the current DB11 platform architecture. This means it gets a 2+2 layout, the practical element referred to a moment ago. It’s no Rapide as far as rear seat roominess goes, but the two seatlets allow the possibility of a double date downtown if the rear passengers are smaller in stature, or more realistically the ability to drop kids off at school on the way to the office. The brown and black luggage shown is gorgeous, but interestingly it doesn’t match the DBS Superleggera’s black and red interior at all. Then again this is an Aston Martin, which means that red highlights on black aromatic Caithness leather and Alcantara is hardly the only interior combination on offer, but rather almost anything imaginable can be handcrafted by the skilled artisans on the Gaydon factory floor. The leather and Alcantara come standard, as does the race-inspired flat-bottom Obsidian Black steering wheel and gorgeous quilted Sports Plus performance seats with DBS embroidered logos in the headrests. Basing the DBS Superleggera on the new DB11 also means that the gauge cluster and infotainment interface are as modern and up-to-date as anything in the industry, which actually might be a saddening story to lovers of the stunning analogue dials in the outgoing Vanquish S. Take some relief in the digital tachometer continuing to spin counterclockwise, and rejoice in the standard centre-mounted tablet-style 8.0-inch display that’s eons more advanced than the outgoing system, including its standard 360-degree parking camera with Parking Distance Display and Park Assist, navigation with detailed mapping, Bluetooth phone connectivity with audio streaming, Wi-Fi, and more. It’s all controlled by a knurled metal-edged rotating dial that sits under a comfortable palm rest on the front portion of the lower console, that’s both easy to reach and operate. Now that we’re talking features, each DBS Superleggera also comes standard with full LED headlamps, signature LED taillights, a gloss carbon fibre exterior body pack, a quad of exhaust pipes with matte black finishers, 21-inch forged Y-spoke alloy wheels, a black cross brace under the hood, keyless entry, Piano Black interior trim inlays, side mirror tilt down on reverse, an electromechanical park brake, dual-zone automatic temperature control, front and rear parking sensors, heatable memory-infused front seats, tire pressure monitoring, and much more for a base price of just over $365,000. Some functional options that can add to the DBS Superleggera’s daily livability include ventilated front seats, a garage door opener, Bang & Olufsen BeoSound audio, Aston Martin tracking, and more. Saving the best until last, all of the DBS Superleggera’s beautifully sculpted Reichman-designed bodywork is made from carbon-fibre composite, whereas an extruded bonded aluminum framework is hidden below. This keeps its curb weight down to just 1,693 kilograms, distributed 51:49 front to rear for optimal balance. The various exposed carbon-fibre aero bits are designed to maximize downforce while minimizing drag, critically important for such a lightweight car traveling at speeds of up to 340 km/h (211 mph). 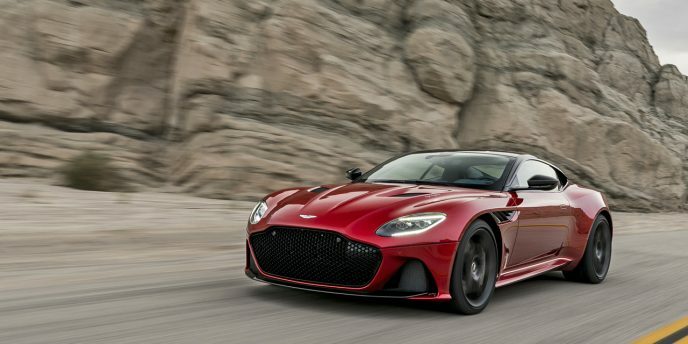 Amazingly, the DBS Superleggera’s bodywork generates 180 kilograms of downforce at VMAX (maximum velocity), which is the highest figure ever registered for a series production Aston Martin. Even better, the increased downforce doesn’t cause any extra drag. Could it be the F1-inspired double diffuser or the modified DB11 curlicue and Aeroblade aerodynamics that allow such impressive aero characteristics? No doubt a combination of all three, plus this super GT’s beautiful shape from imposing nose to upswept tail. Zero to 100km/h takes just 3.4 seconds while 0 to 160 km/h arrives in a mere 6.4 seconds, so inhale deeply before takeoff or you might end up feeling lightheaded from breathlessness. Likewise, Aston claims class-leading in-gear acceleration of 4.2 seconds from 80 to 160 km/h while using fourth gear, this showing the overall tractability of the powertrain. The engine is Aston Martin’s in-house designed and built 5.2-litre twin-turbo V12, capable of spooling up a sobering 715 horsepower and 664 lb-ft of torque from just 1,800 rpm. All of that power exits the rear wheels via an alloy torque tube filled with a carbon-fibre propeller shaft, a new rear mid-mounted ZF eight-speed automatic gearbox, a mechanical limited-slip differential, dynamic torque vectoring, and a lower 2.93:1 final drive. Taming this beast of an engine is a chassis that Aston evolved from the DB11, featuring forged double wishbones up front and a multi-link setup in back. The newest version of Aston’s adaptive damping system comes standard, comprised of sensors that detect road conditions as well as driver inputs before instantaneously making adjustments, all predicated via three dynamic driving modes dubbed GT, Sport and Sport Plus. A credible replacement for the Vanquish S and new flagship for the Aston Martin brand, the new 2019 DBS Superleggera is now available to order from your local Aston Martin retailer. I’d say don’t miss out, but its stunning design, superb performance, and limited supply make such a statement too obvious to mention. The age-old question “Porsche 911 Turbo or Aston Martin Vantage?” has taken on even greater relevance this year, due to the arrival of the all-new 2019 Vantage. Making the argument from Gaydon, England even more appealing, the revolutionary new Brit is $11,705 less expensive than the continually evolutionary German, at $172,495 compared to $184,200 (2018 model year pricing). If you think that’s impressive, consider the 2019 Vantage is a shocking $50,940 more affordable than the previous generation, that being the $223,435 2017 iteration that only came to Canada in 565-horsepower V12-powered trim. Then again, only a year prior the base 2016 V8 Vantage was priced at a mere $109,400, just above the 370-horsepower Porsche 911’s starting price, but before we stop celebrating the just-noted $50k savings and begin to lambaste the UK powers that be for upping the new 2019 model’s price by $63,095, consider its 4.7-litre V8 only made 420 horsepower and 346 lb-ft of torque compared to the new 2019 model’s 4.0-litre twin-turbo V8 that puts out 503 ponies and 505 lb-ft of twist, and then factor in that it’s a completely redesigned car from the ground up, making the outgoing model look and feel like the modern-day classic it truly was. After all, the Vantage dates back to 2005, and during that near 14-year period it had only seen minor updates. Such is common amongst smaller industry players in the ultra-luxury sector, with similarly positioned cars such as Bentley’s Continental GT dating all the way back to 2003, despite a second-generation in 2011 that looked very much like the original. That Continental is totally new for 2019 too, and beautiful in its own right, but we can safely say the new Vantage is a far more radical design departure from its predecessor than Bentley’s upcoming Conti is from its forebear. The new AMV 8 was heavily influenced by the sensational DB10 prototype best known for its “star car” appearance in the 2015 James Bond film Spectre, although close inspection shows a great deal of refinement from concept to reality. The result is a major deviation from the classic Aston Martin grille design, or at least the placement thereof. To be clear, the general shape of the grille remains the same, this easier to see with Vantage models featuring the inner outline of their grille painted in a coat of bright, colourful Lime Essense, but with cars that alternatively leave this section shaded in a darker hue the lower portion of the grille seems to completely disappear into the road surface below. Certainly Aston will allow customers to play with this optical illusion via the myriad paint colours available, which should provide some wonderful results. In the end, enlarging and lowering the classic AM grille has created an entirely new, much more modern look for a brand that was probably relying too much on past glories before, while keeping all-important heritage fully intact. The flush LED headlamp clusters look small in comparison to that grille, while the always long and elegant Aston hood appears even more extended thanks to the need to reach further downward to meet the grille. Likewise, the front fenders snuggly hug a large set of alloys, leaving a mere sliver of bonded aluminum bodywork above before bending inward to incorporate subtle functional side gill wheel well vents. These bleed rearward into the door skins that hover over wide sill extensions, the latter visually pulled around the car from the front splitter. Those thinking the design departure is radical when watching a new Vantage approach may realize they hadn’t seen the half of it upon witnessing its hind end round the corner, the model’s single curving car-width taillight an impressive display of LED creativity in action. The rear lamp fluidly flows with the uniquely shaped Kamm-like tail design, raised up in the middle like sports car racers of the past, while the working rear diffuser under the bumper cap looks as if it could’ve been pulled directly from a World Endurance Championship (WEC) Vantage GTE racecar. Like with the new DB11 V8, the new hand built 4.0-litre twin-turbocharged eight-cylinder stuffed under the Vantage hood hails from Mercedes-AMG, although Aston tunes it for their unique feel and sound. Standstill to 100km/h takes a mere 3.6 seconds, this aided by a 1,530-kilogram curb weight. Aston’s engineering team positioned the new engine as far forward and as low as the chassis design allowed, which resulted in ideal 50/50 weight distribution. 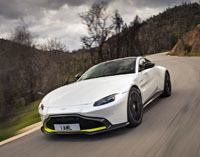 That balance was aided by the new Vantage’ rear-mounted, eight-speed ZF automatic transmission, while the carbon-fibre driveshaft that spins in an alloy torque tube benefits all performance criteria. The automatic is standard, which means no manual gearbox is available for the time being, but rumour has it a seven-speed DIY transmission will become the base gearbox in the near future. Of course, Aston provides the Vantage with driver selectable modes including Sport, Sport Plus and Track, while the new electronically controlled differential is a Gaydon first, this working in conjunction with the braking system to enhance high speed handling via torque vectoring. Being that the Vantage is the sportiest Aston in the lineup, its speed-sensitive electric power steering features a tighter lock-to-lock ratio than the larger DB11, while it’s also tweaked for more aggression off-centre. 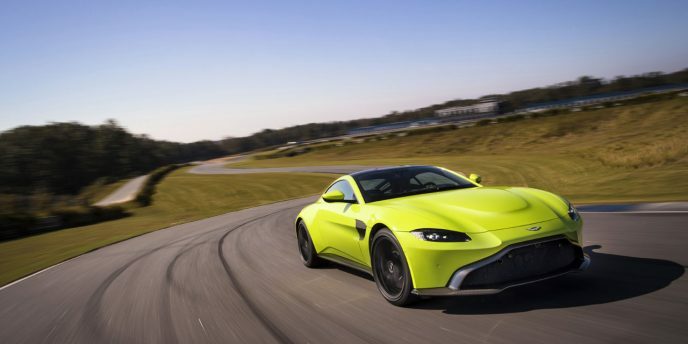 Added to this is a 2,704-mm wheelbase, the new Vantage 100-mm shorter than the DB11 and therefore more reactive to turn-in through tight, fast-paced corners. Sharing components with its larger sibling would only make sense, and to that end 30 percent of the aluminum Vantage chassis comes from the DB11. This of course means that 70 percent of the Vantage chassis is completely unique, this portion including the rear frame that’s now solidly mounted to increase lateral rigidity. The stiffer design results in 2.2 degrees of roll per cornering G-force, which compares to 3.0 degrees with the DB11. Additionally, the newest version of Aston’s Skyhook adaptive suspension provides progressively firmer damping characteristics in its various drive modes, while that 30-percent figure mentioned a moment ago relates to the front suspension components pulled from the DB11. As you might expect, the new Vantage interior is now fully immersed in the 21st century, so therefore along with the usual Aston Martin handmade detailing of carbon-fibre, aluminum, leather and suede-like Alcantara trim and upholstery finishings, it incorporates the latest high-resolution digital displays ahead of the driver and atop the centre stack. The latter is an 8.0-inch touchscreen, which, like in the DB11, is sourced from Daimler’s parts bin, along with its knurled metal rotating wheel controller and palm rest. Speaking of knurled metal, Aston has kept its trio of rotating metal knobs on the centre stack, albeit now the centre one is part of the HVAC system, while a bevy of metal trimmed rocker switches fills the open spaces in between while rows of buttons line each side of the aforementioned infotainment controller on the lower console. Additionally, the ignition and gear selector buttons have been repositioned from a horizontal row high on the centre stack to an inverted “V” formation below, where the stack bends into the lower console, while shifts continue to be executed by large, metal paddles fixed to the steering column. The steering wheel is an appropriately sporty flat-bottomed, leather-wrapped design that features just enough switchgear to appear modern yet not enough to look cluttered. It frames a fully configurable TFT gauge cluster, just like the DB11, which is an important step that once again locks Aston into the new century, yet traditionalists will miss the glorious mechanical/analogue dials that have long been part of the AM mystique. Comfort is reportedly large on ultra-luxury buyers’ wish lists, even in the more performance-oriented classes, so therefore the new Vantage passenger compartment is improved ergonomically with more headroom and legroom, plus some additional side-to-side spaciousness. As you might expect, the new Vantage is well equipped with luxury and convenience features too, but take note you’ll still need to pay extra for heatable seats, parking assist, blindspot monitoring, adaptive cruise control, etcetera. Four option packages include Sport, Exterior Black, Tech, and Comfort, with each of these allowing for ample personalization as well. The 2019 Aston Martin Vantage is available now, but those wanting the convertible Volante version will need to wait until 2019. The visual changes are subtle yet effective. A reshaped front splitter, grille surround, and rear diffuser are formed from exposed carbon-fibre, providing reduced frontal lift with minimal added drag. Additionally, dual twin-tip exhaust outlets free up exiting gases and enhance the auditory experience, while options include painted graphics packages, 20-inch diamond-turned five-spoke alloys, and carbon-fibre hood louvres. The real meat of the Vanquish S can be found under that long, elegantly domed hood, Gaydon’s naturally aspirated 6.0-litre V12 now tuned to 580 horsepower at 7,000 rpm, which due to larger, freer-breathing intake manifolds results in a 12-horsepower gain over the outgoing non-S Vanquish, as well as ultra-quick throttle response. Peak torque remains the same with 465 lb-ft arriving at 5,500 rpm, which is good enough for three-tenths off of the previous 568 horsepower Vanquish’ zero to 100km/h sprint time of just 3.5 seconds instead of 3.8, ahead of an identical 323-km/h (201-mph) top speed. Still, there’s much more to the Vanquish S performance advantage than mere straight-line acceleration. The result is a car that’s incredibly strong off the line, the immediacy of its power made even more potent due to the Vanquish S’ lighter-weight all-carbon fibre bodywork, which of course does much more than just quicken off-the-line performance. Thanks to that lightness and increased rigidity it aids lateral control too, for a car that feels much more agile than anything so large should when pushed beyond limits that would humble lesser competitors. This lightness was most noticeable during fast-paced transitional manoeuvres that can often unsettle large GTs, yet the Vanquish S held its ground so naturally it was if I were Daniel Ricciardo diving down the inside of multiple opponents in his Aston Martin-branded Red Bull Racing F1 car on his way to winning the 2018 Chinese Grand Prix—how I wish. More likely I’d end up taking out my teammate at the first turn, or more precisely on the 40th lap as was the case in the Azerbaijan Grand Prix two weeks later (of course it’s unfair to fully blame Danny Ric for slamming into Max Verstappen’s gearbox when the latter blocked with an illegal second move). On that note front seat roominess is exemplary, so all but the smallest jockeys and tallest NBA centres shouldn’t have a problem fitting in, and even those sized outside of the norm can likely be custom fitted by Aston’s bespoke department. 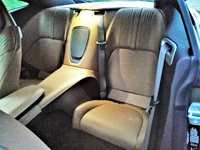 As for rear seat accommodations, bringing along two or a maximum of three extra passengers will first depend on whether you’ve opted for the $5,563 2+2 Seating Arrangement and then on the height of first row occupants, as pushing the front seats all the way rearward completely eliminates second-row legroom. A driver measuring up to my slightly below average five-foot-eight frame will allow for a smaller adult or kids behind, which is a far cry more accommodating than the two-seat version or some other dual-income-no-kids alternative, so I can recommend the Vanquish S 2+2 for a medium-build person or couple with up to two small children. Additionally, the trunk is fairly well proportioned for this class of car, and beautifully finished as you might expect. Those kids will feel pretty lucky to climb inside a Vanquish S, and possibly not for the same reasons as you. Looking at the car I was immediately filled with thoughts of 007 remotely piloting an original V12 Vanquish (2001–2005) in the 20th James Bond spy action film Die Another Day (2002), yet once we opened the door and peered inside my considerably younger partner came up with Spiderman, her mind inspired by the beautifully detailed “web” of hand-stitching across the seat inserts, door panels, and even the roofliner. It’s actually Aston’s $4,632.84 optional Filograph Quilting upgrade, just one of many improvements made to the car I was driving. 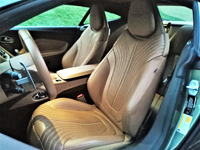 The rest of the interior’s leather was stitched in a courser contrasting thread, this a $752.40 upgrade, while the seats had $1,248.50 Micro Perforated Leather inserts. As with all Aston Martins the Vanquish S comes fitted with a level of luxury few peers can match, some additional highlights including an available Satin Chopped Carbon Fibre centre stack panel, included in my tester for $3,904.56, or Bridge of Weir Caithness leather (not included). Other interior options that were added to my tester car include an $8,415 Contemporary and Luxury Pack, a $2,105 Interior Shadow Pack, a second glass key at $990, and more, while exterior upgrades included $12,160 for a Carbon Fibre Plus Pack, $5,563 for a Vanquish S Graphics Pack, $2,778 for a Shadow Exterior Pack, $2,105 for black brake calipers, $990 for black mesh grilles on the hood and side strakes, a $361 aluminum fuel filler cap, $177.50 for V12 side badges, and more for a total of $55,979.80 in extras overtop the base Vanquish S’ suggested retail price of $352,380, resulting in a grand total of $408,359.80 before fees and taxes. Of course, paying the price of a (very small) Toronto or Vancouver condo for a sports car won’t be in everyone’s budget, but this inadvertently produces some of its allure, exclusivity. You won’t see many of these super GTs driving around the corner, even in the latter Supercar Capital city (although I saw a gorgeous white Vanquish in Richmond, BC last month, tentatively driven by a young 20-something woman), but everyone in the know will know exactly what it is, a Vanquish S commanding immediate respect. There’s also a very real cost that comes with engineering and then handcrafting small numbers of cars from carbon-fibre, let alone all the other meticulously detailed handy work found on the exterior and throughout the cabin. To that end, the Vanquish S uses Aston’s proprietary glass key fob that slots into the middle of the centre stack, and gets pushed further to ignite the engine. You select gears via the pushbuttons to either side, this being a basic PRND layout, while manual shifting takes place via paddle shifters to each side of the steering column. These don’t rotate with the steering wheel but rather stay fixed in place, which is exactly what’s required in a high performance car, as you’ll always know exactly where they are when you need to give them a tug. The steering wheel is also a straightforward, uncluttered device, with minimal switchgear. Seat controls are on the transmission tunnel, while most of the buttons on the centre stack are touch-sensitive. That centre stack will be familiar territory to Aston Martin fans, and looks more boutique than the recently updated DB11 and Vantage interiors, but I love that about it. The four big metal knobs feature knurled edges, and there’s a substantive weight to them that most buying into this price class should appreciate, but of course their aluminum construction means they don’t really weigh much at all, important for a car with such sporting pretensions. Amongst favourite details, the Vanquish S’ analogue gauge cluster spins the tachometer counterclockwise in Aston Martin tradition, just a little nod to the past that any classic car fan will appreciate, while the infotainment display atop the centre dash is easy to use and filled with some of the brand’s more recent graphical, system and feature upgrades, the latter including navigation with nice colour mapping, a backup camera and more. Most importantly, though, the young woman just mentioned shows the Vanquish is relatively easy to drive for a super GT, despite its otherworldly performance. Truly, I could live with this car day in and day out, and I would never say that about many low-slung, mid-engine supercars. Some might think it difficult to justify the $350k Vanquish S starting price, but compared to many of the supercars in the less comfortable class this Aston Martin super GT is a bargain, but still some without means or appreciation may see it as frivolous. After all, none of us need a car like this, yet even though it’s completely out of my personal reach from an ownership perspective I’ll appreciate the person who steps up to purchase it, as I’ll still be able to enjoy its beautiful lines and sonorous exhaust note whenever it passes by, and that will bring back particularly pleasant memories spent with this Cobalt Blue example. Aston Martin has been revising its entire model range in recent years, with a dynamic new take on its quintessentially British design language and a completely new V8 and V12 engine lineup. Maintaining its forward momentum, the DB11 Coupe, universally praised after its 2017 introduction, gets a soft-top convertible Volante model for 2018, due to arrive across the country next month. The DB11 Volante replaces the outgoing DB9 Volante, a model that’s served Aston faithfully for more than a dozen years. 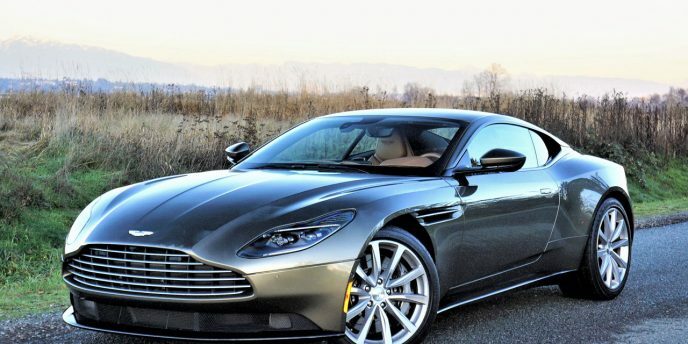 Where the old Marek Reichman and Henrik Fisker designed model has become a modern-day classic, revered by industry professionals and owners alike, not to mention car enthusiasts the world over, the new DB11, once again penned by Reichman, merges all that’s good from the past with an edgy new sophistication. The DB11 Volante doesn’t deviate from the DB11 Coupe’s successful design below the shoulder-line, a good thing as the model’s new take on the trademark A-M grille, striking LED headlamps, elegant single-piece aluminum hood, dramatic front fender vents, muscular rear fender swells, sharply cut trunk lid, ultra-slim ‘light blade’ LED tail lamps, and diffuser-infused rear apron nears visual perfection. While new forged alloy wheels round out the lower design, the new open-top model gets even better as eyes climb upward. Perched atop a similarly raked windshield and A-pillars to the DB11 Coupe up front, and an artistically reformed deck lid in back, sits a classic retractable fabric roof that melds perfectly into the car’s sweptback profile. Available in Black Silver, Grey Silver or Bordeaux Red, the all-new eight-layer convertible top utilizes the latest acoustic sound deadening and climate isolating insulation materials, providing four-season comfort and NVH levels, while it powers down to a class-leading stack height in just 14 seconds at speeds of up to 50 km/h with a 50 km/h headwind, plus back up again in only 16 seconds. The DB11 Volante offers most of the same standard and optional features as the new DB11 Coupe, including an entirely new configurable digital gauge cluster with superb graphics, clear, crisp resolution, and wonderful depth of colour, plus an equally impressive centre stack-mounted infotainment display controlled by a knurled metal-edged rotating dial and gesture-sensing palm rest on the lower console. 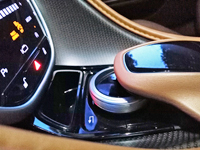 Both Daimler-sourced electronic interfaces are filled with the latest features and apps, including full smartphone integration, while the rest of the interior comes finished in the auto industry’s best quality materials and most exacting artisanship. Upping its game, the front seatbacks of the DB11 Volante even feature hardwood or carbon fibre veneer panels that easily pull eyeballs when the top is dropped. While the standard and optional features list is long and full, Aston makes a special point of noting the DB11 Volante’s new heatable steering wheel as an encouragement for all-season open-air motoring (which we wholly support), and also states that new Volante-first rear seat ISOFIX attachment points bring a new level of practicality to owners with small children. Regarding performance, the DB11 Coupe first arrived with Aston’s new V12, which was engineered by a team from the company’s UK division yet continues to be produced in the automaker’s dedicated Cologne, Germany engine facility, but take note the DB11 Volante won’t be available with the V12 at all, at least not at first, but instead will utilize the brand’s new 4.0-litre V8, sourced from AMG-Mercedes ahead of fine-tuning by A-M’s engine team. The new V8, which makes 503 horsepower, 498 lb-ft of torque, and comes mated to a new paddle shifter-enhanced ZF-sourced eight-speed automatic transmission with incredibly quick yet especially smooth shift intervals, was a new arrival for the 2018 DB11 Coupe late last year, and is an ideal fit for the new convertible. 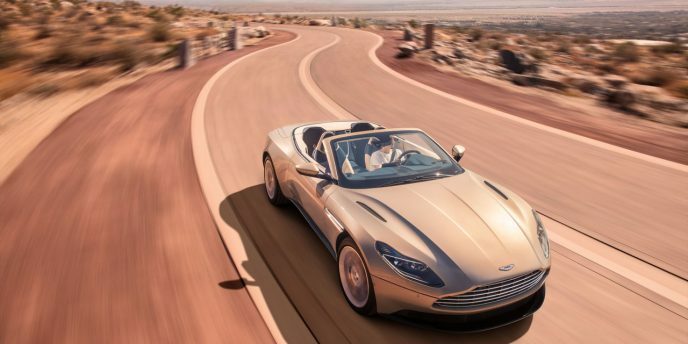 The lighter weight V8 fits further rearward in the car’s chassis to aid overall balance, plus performance is also helped by a new DB11 Volante that’s considerably lighter and more rigid than the model it replaces, its bonded aluminum body structure carried forward from the DB11 Coupe yet stiffened in key areas to compensate for losing its roof. DB11 Volante trunk volume has grown by 20 percent over the outgoing DB9 Volante, while the car’s increased cabin space, comfort, plus its reported ride quality and driving ease seem diametrically opposed to its overall improved performance. To this end the new model incorporates three-stage powertrain and chassis modes that are engineered to suit most any driver’s mood or road/weather condition, while new electric power steering plus a limited-slip differential with dynamic torque vectoring provide levels of all-season control not possible before. The new 2018 DB11 Volante arrives at Aston Martin dealerships across Canada next month, although orders are being taken now. Contact your local retailer for details. More than a year has passed since I drove Aston Martin’s then new 2017 DB11 Launch Edition, but the memory remains indelibly stamped in my limbic system. It’s easy to recall the animalistic snarl of its 600 horsepower twin-turbo 5.2-litre V12, not to mention its otherworldly 3.9-second sprint to 100km/h, which happens to be 0.7 seconds quicker than the wonderful DB9 I remember fondly as well. I’ll still have to take Gaydon at its word regarding top speed, as my city’s local racetrack wouldn’t even be capable of speeds up to 322 km/h (201 mph), that number 27 km/h faster than the DB9 that I also enjoyed fully at moderate speeds yet never experienced at full flight. So with a powertrain like that, what’s all the fuss about a downgraded V8 variant? The new 4.0-litre twin-turbocharged V8 makes a sizeable 503 horsepower and 498 lb-ft of torque, which might be a step down from the V12, but is a major move up from Aston’s outgoing 4.7-litre naturally aspirated V8 that put out 430 horsepower and 361 lb-ft of torque in top-line “S” guise. Interestingly, this allows a zero to 100km/h sprint time of 4.0 seconds, which as you’ll note above is near identical to the V12-powered DB11, while the V8’s top speed (that I’ll likely never see) is rated at 301 km/h (187 mph). This one hails from Mercedes’ AMG headquarters, unlike the in-house engineered and produced V12 that remains an upgrade, but it nevertheless continues to be individually hand-built. At this point, purists might begrudge Aston for deriving its entry-level engine from an outsider, but keep in mind the old AJ37 V8 was initially sourced from Ford before being thoroughly massaged and hand-built for A-M application. Also notable, excuse the pun, the new engine’s mechanical melody and exhaust system’s bellow are wholly unique when compared to the old V8 and either old or new V12, moving away from higher pitched tenor-like lightning cracks to a baritone’s thunder, albeit both fully capable of stimulating adrenal releases from enthusiasts. As a bit of an historic aside, Aston Martin has had a V8 in its lineup since 1969, the original DBS V8 and even more appealing (in my opinion) V8 series 1 through 5 models that followed being personal favourite Astons, likely due to their prominence in my formative years. Aston built just over 4,000 V8 examples within a 20-year tenure (a tiny figure considering the company delivered more than 5,000 cars last year alone), including high-powered Vantage and drop-top Volante versions, not to mention the unorthodox 1986–1990 V8 Zagato. V8 power continued in the 1989–2000 Virage and then came back for the 2005–2017 Vantage we all know and love, now replaced by an all new 2018 Vantage with the new DB11 V8’s mill behind its radically reworked A-M grille. As for DB models (DB incidentally short for Sir David Brown, Aston Martin’s owner as of 1947, and DBS for David Brown & Sons, his great uncle’s gear manufacturing business (that supplied Aston Martin amongst others) who’s sons first gave him an apprenticeship at age 17, before he eventually became its managing director), only the DBS used a V8, making the return of V8 power in a DB series car eventful. While the engine comes completed from AMG, Aston adds its own air intake, exhaust system, and slimline wet sump lubrication design, the latter allowing a lower centre of gravity. A-M also created new ECU software and reprogrammed the engine and throttle mapping, giving it performance characteristics and sound qualities more familiar to the brand, all before fastening it into the DB11’s engine bay via bespoke engine mounts (you really need to take a look around under its clamshell hood as you not only get an excellent view of the nicely finished engine and robust aluminum strut tower braces, but also get to peak at the suspension bits below some wafer-thin racecar-like CFRP fender panels). I’d like to think Aston Martin owners are environmentally conscious, although such issues probably don’t matter as much to the brand’s performance- and luxury-oriented clientele as to the automaker itself, which is forced to deal with a literal world of regulating bodies that are forever increasing their emissions restrictions. It therefore only makes sense for A-M to be proud of the new V8’s CO2 figure of 230g/km, which allows for lower taxation rates in key growth markets like China. Likewise, the V8 is considerably more fuel-efficient than the V12, its Transport Canada numbers being 13.0 L/100km in the city, 9.8 on the highway and 11.5 combined compared to 15.5 city, 11.4 highway and 13.7 combined. These figures reflect the use of the DB11’s standard auto start/stop system, which alternatively can be shut off if you’d rather listen to the engine/exhaust rumble at idle. Both engines use an eight-speed ZF automatic transmission mounted mid-ship for better weight distribution, and it’s by far the smoothest Aston gearbox I’ve ever experienced, yet it transitions through cogs at a wickedly quick rate when switched to Sport Plus mode. Alternative default GT and Sport modes provide less aggressive application, while you’ve got the choice of DIY steering wheel paddles or complete automation. After time well spent with the new 2018 DB11 V8 I can attest that most buyers should be completely satisfied with its everyday performance. Even slight dabs at the throttle produce instant response, this aided by a lightweight, extra rigid carbon-fibre driveshaft, yet acceleration ramps up smoothly and effortlessly, while that sonorous growl is ever-present, albeit never overwhelming. Yes, leave any thoughts of supercar extremism to the new Vantage, as the DB11 is a brilliantly capable grand touring car that’s big on refinement, comfort and ease of use. In fact, it’s one of the easiest ultra-luxury GTs I’ve driven around busy city streets. The evenly weighted yet wonderfully reactive Bosch electric steering is near effortless to direct even when negotiating confining parking spots or tooling around town, which is surprising considering how meaty the rubber is underneath and how unfathomably capable it is through the corners. It really does feel more agile through tight figure-hugging curves and more stable at high speeds, Aston attributing this to “detailed revisions to the suspension bushing, geometry, anti-roll bars, springs, dampers and ESP software,” or so it said in the DB11 V8 press release. It’s all aided by a smaller engine that’s 115 kilos (254 pounds) lighter than the V12, while the entire car weighs in at just 1,760 kilograms (3,880 lbs). Of course the lighter engine reduces mass over the front wheels, plus the V8 gets pushed rearward behind the front axle for better weight distribution. It all makes for a thoroughly sporting GT that never forgets that comfort is king. On that note, there is no difference between V8 or V12 cabins, as each DB11 receives an identical list of standard features and the same extensive menu of available colours and optional trims. My tester, finished in elegant Arizona Bronze, including its mirror caps, door handles, roof strakes and top panel, plus black mesh hood duct finishers, gloss black lower extremities with bright details elsewhere, and rounded out by standard 20-inch 10-spoke alloy wheels framing subtle light grey-painted calipers, was fitted with a gorgeous saddle tan leather interior featuring beautiful quilting and ornately decorated perforations, not to mention oh-so British brogue detailing highlighted by lovely cream leather underlay below. I need to stop right here to explain how incredibly soft the leather is. It’s exquisitely finished, while the detailing of the perforations and stitching are like nothing else I’ve ever seen. Aston Martin truly does some of the best leatherwork in the industry, and the DB11 pays the utmost respect to this tradition. The stitched leather continues onto the dash top, instrument panel and most everywhere else inside, Aston even wrapping the steering wheel in matching hides for a look that was more about country club class than racetrack flash. A unique swath of black Satin 2×2 Twill Carbon vertically split the dash top into two before surfacing the centre stack background as well as the door inserts, the latter panels enhanced with yet more tan leather and satin aluminum detailing even including the speaker grilles, the genuine lightweight metal similar to other brightwork throughout the interior, which Aston collectively calls its “Jewellery Pack” (alternatively available in a “Dark” tone). The roof pillars and headliner were covered in black suede-like Alcantara for a rich look and sumptuous feel, not to mention a hushed overhead ambience. All in all, I believe this is Aston’s best work to date, as it combines the old world charm its cars have been lauded for since the marque was created 105 years ago, with a completely new level of refined modernity. On that note, Gaydon did its level best to keep up with industry-wide in-car infotainment developments with its previous DB9 and Vantage models, but when production runs last a dozen years or so it’s nearly impossible to meet the demands of new consumers being weaned on iPads and Android tablets. Fortunately the DB11 relegates small displays with simple graphics and rudimentary controls to the past, not to mention Aston’s glorious analogue primary gauges. The new model replaces the mechanical wizardry of whirring dials, the tachometer of which always spun in the opposite direction to anything else on the market, with a colourful display of fully configurable readouts, each rich in contrast, high in resolution, and graphically artistic. It’ll be an impressive sight for anyone stepping up from an older model, and truly adds to the driving experience thanks to loads of functionality, but something tells me that one day in the not too distant future Aston will be reoffering analogue gauge clusters as multi-thousand-dollar upgrades, in similitude to the move up from a quartz-infused luxury timepiece like the Omega Speedmaster Skywalker X-33 to a mechanical one such as the same Swiss watchmaker’s Professional Moonwatch. Unless you’ve spent time in Mercedes’ more recent models you probably won’t notice where Aston sourced its electronics, the gauge cluster less obvious yet the 8.0-inch tablet-style infotainment display atop the centre stack and palm rest/knurled metal rotating selector on the lower console dead giveaways. The latter is infused with all the latest functions, such as character recognition, multi-touch responsiveness, gesture capability, etcetera, while the former displays an entirely new level of clarity, artistry, and processing speed. The result is an easily sorted system with superb navigation accuracy, wonderfully detailed mapping, split-screen backup and overhead 360-degree surround parking cameras, and plenty more, while the audio system delivered good sound quality, albeit not as impressive as the optional Bang & Olufsen BeoSound system tested in last year’s DB11 V12. Along with the enhanced displays is much improved centre stack switchgear, the topmost circular buttons set aside for Aston’s pushbutton ignition and trademark gear selection, the midsection for the dual-zone auto HVAC interface, which included heated and ventilated seat controls, those just below for infotainment, audio, parking sonar, camera, the aforementioned auto start/stop system, locks, etc. It’s a tidier assortment of buttons, knobs and toggles, still enhanced by stylish satin silver anodized metal yet no longer overwhelmed by big billet aluminum knobs. Consider it gentrified, if you can say such about an Aston Martin, thanks to touch-sensitive switchgear, crisp, clear backlit script and displays, plus more, but it’s still oozing with character. The 2018 DB11 V8 starts at $233,650, a significant $20k and change more affordable than the V12 version, while standard features on each include simpler full-grain leather upholstery than noted above, the Alcantara headliner, pushbutton ignition, configurable gauges, 8.0-inch infotainment display, navigation, 360-degree camera, and dual-zone auto climate control mentioned earlier, as well as Wi-Fi, two USB ports, front and rear parking sensors, and much more. Myriad exterior and interior colourways and trim options are available, while additional extras include multiple wheels, various leather textures and inlays, seat embroidery and/or embossing, a mid-grade Premium audio upgrade as well as the top-line B&O system, a universal garage door opener, blindspot monitoring, auto park assist, and more. From a livability perspective, the driving position is superb, with excellent reach and rake from the steering column, and wonderfully comfortable, multi-adjustable seats. Their three-way warmers and coolers improve comfort yet further, while everything else about the DB11 is much more user-friendly than the previous model. What’s more, the steering wheel has a slightly flat bottom, making ingress and egress easier. Continuing this practical theme, the powered seat system only requires a slight tug on a strap up top to tip the seatback forward before it glides in the same direction via its own power, allowing relatively easy access to the rear seats. You probably already guessed those rear seats are very small, but they’re good enough for children. This makes the DB11 a good GT choice for someone with a young family or for grandparents with grandkids, although anybody regularly transporting larger teens or adults might want to consider the longer and more accommodating four-door Rapide S.
If you’re fortunate enough to see a DB11 parked at the side of the road or witness one pass by, or better yet if you’re in the dealership preparing to go for a drive, an easy way to differentiate the new V8 from the V12 are the nostril-style engine vents atop the hood, the V8 removing two from the centre panels for what I think is a cleaner look, while darkened headlamp bezels and unique wheels help to set it apart further. This last point probably summarizes the new DB11 V8 quite well. While most of us would probably gravitate to the V12 if money were no object, if only because it’s higher up the pecking order, it’s not necessarily the better car. Both models thoroughly impress in their own unique ways, and each is different enough to be preferred over the other. I can also attest to these being the best Aston Martin GTs ever made.